with Phillips & MacConnal, London. Godward's style varied little throughout his career. This picture is a fine example of his later oeuvre, where his skill in describing texture and his responsiveness to the langourous sensuality of his models remained undimmed. Praxilla was a lyric poetess of Sicyon, but the sitter carries no attributes to identify her as such. 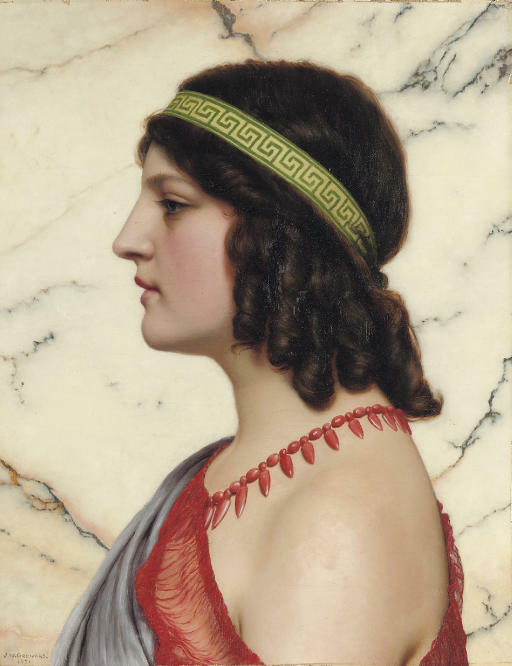 Godward added names to his pictures, often after they were completed, merely as a foil to their aesthetics. Like Alma-Tadema, he scrupulously copied examples of Persian and Greek jewellery, often discovered in the British Museum and elsewhere, but he was not a purist in the way they were used, sometimes mixing items for decorative effect. The model for the picture was the artist's last, who sat to him in 1921 after his return to his house in the Fulham Road following a ten year stay in Italy. She has tentatively been identified as Marietta Avico. The picture is a relatively recent rediscovery, and as such does not appear in Professor Vern Swanson's catalogue raisonné of the artist.